Heritage is a place, object, location, natural condition, tradition, lifestyle, or ideology, which survive for generations. It passes through love, hatred, cares, veneration, neglect, change, conservation, reformation and destructions. But heritage persists in physical traces and metaphorically ingrained in communications, expressions, mentions or records. It becomes indelible part of the lore. An object must have a real or perceived place, a place needs an effective location or description, and the place, its location or description stays with the people. Heritage is comprehensive image that is set in the society. The society or its sections may liken or detest it, but it continues. The image at times, manifests differently to different people. Heritage is something conveyed intentionally or inadvertently to someone or society. It is something of extraordinary creation, or inherited from the past, it can be practices, characteristics or possession, valued enough to be useful to future generations. It provides people with a sense of identity and continuity. It provides knowledge and fail-safe solutions. Heritage is perceived through cuisine, clothing, lifestyles, artefacts, tools, music, movies, styles of shelter, skills and technologies, religious ceremonies, and performing arts. The physical heritages have visually perceptible character of own, reinforced by the surroundings and focussed by the current circumstances. Symbolic heritages emerge through the holistic character from varying level of cross references or connections in time and space. A physical heritage may get naturally defaced or vandalized, but its images remain in the folklore. So folklore gets enlivened when it connects to even minor trace or evidence of a building, location, objects, or other folklore. The process works more vigorously in other direction. A forgotten physical trace acquires new interest when a fable has mentioned it. UNESCO World Heritage Committee, composed of 21 member nations names, and conserves sites of outstanding cultural or natural importance to the common heritage of humanity. During the last 200 years it has been experienced that wider platform for heritage brings it out of the parochial interests of nationalities, races, cultures and other sectoral categories. Cultural Heritage is now a wider concept where similarities between the various heritage sectors rather than their differences are studied. Various cultures or civilizations represent time and space sections of the humanity. There have been many revivals of the ‘usable pasts’ that have helped heritage consciousness. International heritage conscience is a movement that creates new set of standards for recognition of ethical and natural properties. The heritage site, location or entity must be an extra ordinary representation of ‘human creative genius and cultural significance’ over a span of time. It could be a ‘living civilization or which has disappeared’. It could be living practice, set of traditions or beliefs, artistic and literary works of outstanding nature. As a natural property, a heritage site represents extra ordinary natural phenomena or evolution processes of nature. It may be a location of current ecological and biological awareness. 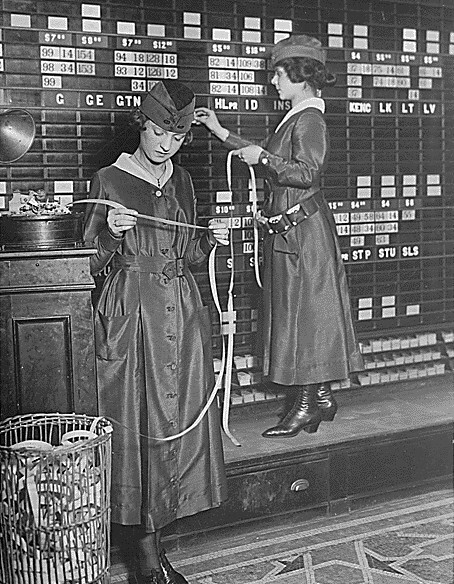 Waldorf-Astoria Hotel girls handling tickers and stock exchange boards.